Shipwreck hunters Maggie Riley and Cole Thatcher are no strangers to the mysteries hidden beneath the seas. They ve uncovered artifacts with secrets that powerful interests would do anything to control and they re about to do it again.As the newly engaged couple prepares to set sail, Cole suspects they are being followed. While he tries to unravel a coded message that hints at a treasure jealously guarded by an ancient society, a bomb is discovered on the couple s yacht. Now it appears that Cole s belief isn t mere paranoia and that the cipher holds information others will kill for.From a sunken submarine off the coast of Tunisia to the hallowed halls of the Vatican, can Riley and Cole outrun a ghost and save a manuscript that could rock the foundations of history?" Christine Kling has spent more than thirty years messing around with boats. She earned an MFA in creative writing from Florida International University, and her articles, essays, and short stories have appeared in numerous magazines and anthologies. 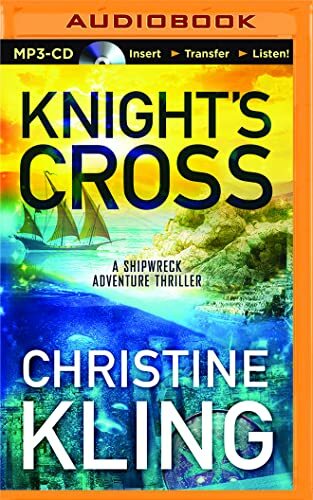 Kling used her sailing experience to write her first four-book Seychelle Sullivan Suspense series and her new Shipwreck Adventure thrillers, Circle of Bones, Dragon’s Triangle, and Knight’s Cross. Having retired from her job as an English professor at Broward College in Fort Lauderdale, Kling now makes her home aboard a fifty-two-foot motorsailor, cruising the South Pacific with her family. You can learn more about her real and fictional sailing adventures by visiting www.christinekling.com.